This was one of the best Grand Prix races for years, with the right mix of super high speeds, close racing, emotion and strategy intrigue which kept the outcome in doubt until the final laps. That Mercedes won the race, against the odds, on Ferrari's home soil is a major blow for the Scuderia that had the best car at Monza and locked out the front row. To turn that position into a second and a fourth is a major disappointment. Pundits have pointed to their lack of soft tyres in the Pirelli selection for Monza and homework on them, as well as the timing of pit stops as the main reasons, but neither were particularly an issue. So how did it happen and what part did their strategy play in the defeat? Ferrari - team orders or not? There is a very human dimension to the drama at Monza, with Kimi Raikkonen towards the end of his career and potentially to be replaced by Charles Leclerc next season, understandably wanting one last race victory. Under normal circumstances that would not be a consideration in a tight championship battle between Sebastian Vettel and Lewis Hamilton. All season long - in fact for several seasons - Raikkonen has been put to work on sub optimal strategies, pulling Mercedes cars into the pits early or challenging them to compromise their race strategies, to help Vettel's chances. The last time he was on pole position, in Monaco last year, Ferrari managed to elegantly move Vettel ahead in the race and Raikkonen had his contract renewed. Here the circumstances were different; he knew that the wishes of the late chairman Sergio Marchionne were for Leclerc to replace him and that it is only a matter of time before that is communicated. Raikkonen took an unexpected pole on Saturday as Vettel was fed out late onto the track for the decisive run in Q3 and effectively lost the chance to pick up a slipstream from Hamilton, but gave one to Raikkonen. So the Finn saw his chance for a final win in front of the tifosi and his young family. If you are serious about trying to win a championship against an adversary like Hamilton, who is in the form of his career, then this shouldn't be a consideration. There are always ways and means to achieve desired outcomes, but only when controlling the race from a position of strength. Vettel however didn't feel that support and was in a difficult spot; he didn't just have Hamilton behind him to consider at the start, but Raikkonen too and the lead he should have had after qualifying. The danger from Hamilton was clear; he would be very aggressive at the start as it was his best shot given that the Mercedes had been a couple of tenths slower all weekend. The mistake Vettel made - or felt forced to make by the circumstances - was in trying to get the lead on the opening lap from Raikkonen, rather than focussing on keeping Hamilton behind and crossing the line 1-2 at the end of the lap to control the race. 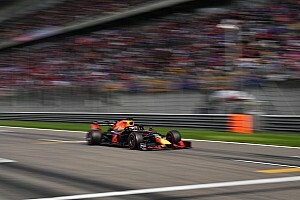 Vettel tried to pass his team mate on a suboptimal line into the second chicane and Hamilton saw his chance, forcing his car into the gap and the pair touched, sending Vettel spinning down to 18th place. This is big picture strategy, the canvas on which the detailed race strategy decisions about tyre degradation and timing of pit stops is later painted. If Raikkonen has a clause in his contract saying that there will be no team orders in the event of a pole position, as suggested, then that is something that could be dealt with later once control of the race had been established. Many a tough negotiation has gone on via team radio down the years. By risking everything at the start, the whole battle plan fell apart. So now Ferrari had to focus on making sure Raikkonen won the race. 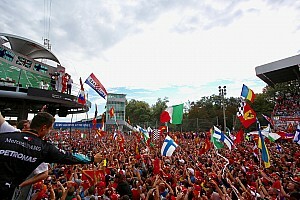 In Vettel's hands the Ferrari would have eased away from the Mercedes, as in Spa and Silverstone and taken the win. Raikkonen couldn't shake Hamilton off and this led to the strategy mistake that cost him the race. It was not the fact that Ferrari had brought only one additional set of soft tyres - apart from the set each driver had for the race. There was no issue there; they did the right thing working on the supersoft, the more tricky tyre to understand and master in limited Friday practice running due to rain. It was more important to optimise performance on that tyre for qualifying and the optimum first stint of the race. Nor was the mistake in bringing Raikkonen in first, on Lap 21, to cover off an undercut attempt by Hamilton who was well within range. This was exactly the right move as to do the reverse would have led to an undercut, given how close Hamilton was. The mistake was the degree and length of time to which Raikkonen was asked to push on the new set of soft tyres after his pit stop. By going hard for five or six laps, he damaged the tyres and that opened up the chance for Hamilton to exploit that weakness later in the race to overtake for the win. Mercedes told Hamilton to stay out when Raikkonen stopped and to push hard. His lap time was strong, but rather than pit him, they extended his stint a lap at a time as the tyres were holding up. He kept this up to the end of Lap 28. And all the time Hamilton was pushing to the limit on tyres that would soon be obsolete, Raikkonen was being told to push on new tyres he would need to the end of the race. This was the strategic mistake; Raikkonen build a larger net lead than he would need - especially as Mercedes had Bottas in play up ahead who would inevitably stay out and hold Raikkonen up - and in doing so he caused a rear blister that would ultimately cost performance and the race win. In the Belgian GP strategy report we alluded to the fact that from this point onwards the second drivers would have a decisive role to play in the outcome of the championship and hinted that Bottas would now be used to help Hamilton. (His contract had just been renewed, so he knew exactly where he stood). This is what happened in Monza, as Bottas was left out on track a long time on the supersoft tyres. He was fighting with Verstappen for a podium, but he also could play a part in holding Raikkonen as the older Finn caught the younger one after the stop. Bottas wasn't exaggerating; he set a personal best lap time during this phase, with a 1m 23.8s on Lap 31, but Raikkonen could have gone much faster. Hamilton was doing 1m 22.1s and Raikkonen could have been on that pace too. 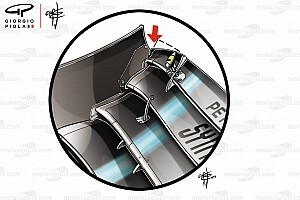 On Lap 33 Bottas began to make some moves in corners that compromised Raikkonen and the lap time dropped to 1m 24.7s as Mercedes caught the Ferrari in a pincer. Hamilton duly took the lead with just nine laps to go and Ferrari who started the day first and second, ended it second and fourth all as result of strategy, both big picture and detailed. Look at Raikkonen's push laps around Lap 21-27, this is when the damage was done. Also compare his pace behind Bottas around laps 31-34 to Hamilton's pace as he catches them.